Have you ever considered praying for your future husband/spouse? If you’re already married, did you ever pray for your spouse before you met them? I’ve been (not always so proudly) single for the last few years, but instead of being (completely) bitter and upset over this season of singleness, I’ve learned to appreciate this time. For the past four years, I’ve been writing letters to my future husband. That might sound crazy, if you’ve never considered this before. Early in my blogging career, I wrote this post for my sweet friend Kara’s blog, called ‘Single, But Someone’s Wife’, and it sums up why I started writing these letters. If you want to learn more about when I started praying for my future husband, read that post first and then jump back into this one :). The idea of starting to pray for your future spouse can be really scary! Like I wrote in that post, “what are you supposed to say to a man you’ve never met, but will eventually know so much about?” Like in anything new, starting is usually the hardest part. 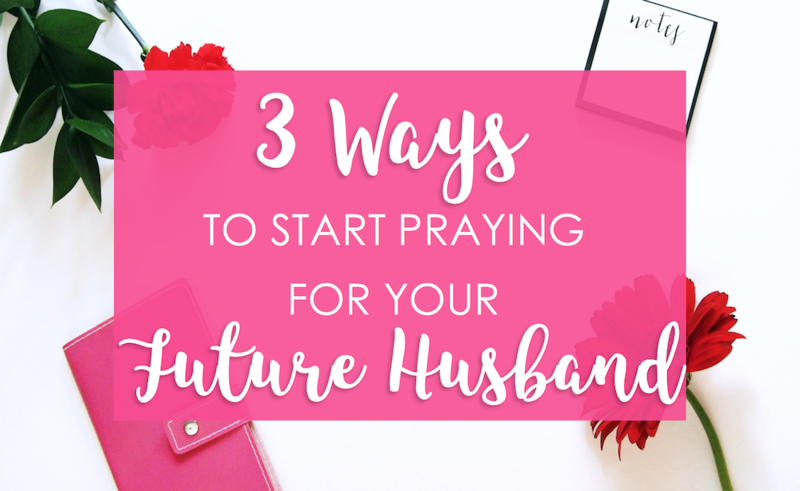 In this post, I’m giving you three practical ways to start praying for your future husband. These are the three things that I did before I started my journal and regularly praying for my future Mr.
It’s easy to get caught up in the ideas of, “but what if I never get married?” and “what if this man doesn’t exist?”. But like faith in Our Almighty Father, I’d rather believe and be proven wrong, than not believe and wish I had. If you’d like to read more about praying for your future husband, I highly recommend checking out Kara’s blog (click here to see her ‘future husband’ archives), or these two posts from my other dear friend, Allison: How to Pray for Your Future Husband & 8 Qualities to Look for in a Future Husband. Like this post? Share this on Pinterest! Do you see the difference? Instead of thinking ‘tall, nice hair, blue eyes, etc.’, think of the real qualities you’d want your future husband to have. What kind of person would you want him to be? How would he treat his family? How would he treat you? How would be act as a husband/leader/father? List these things! And then use some of them in your prayer, but also challenge yourself in these areas. For example, if you’re struggling with patience in your own life, you can also pray for God to help your future husband practice patience, too. As I mentioned, sometimes the hardest part is just getting started. Some say there’s nothing scarier to a writer than a blank page! And I think the same goes for prayer. When I knew I wanted to start praying for my future husband, I definitely didn’t know what to say, either! It doesn’t have to be anything too long or detailed. God already knows your heart! Start by including him in your prayer, and see where it takes you. You can also pray through some of the qualities you listed earlier. My favorite way to pray!! If you saw this post of mine, you know that I’ve begun prayer journaling this year. As a writer, writing out things is my favorite way to clear my mind and organize my thoughts. I currently I have a prayer journal, a personal journal, a future-husband-journal, and a recently-started pseudo-bullet journal for tracking more specific things. So yeah, I like to journal! As I mentioned in my ‘Single, But Someone’s Wife’ post, writing that first letter to my future husband was a little awkward! But after those first few lines, the words came so easily, and now it’s a natural part of my life and prayer time. I write a letter in the future-husband-journal every few months or so (because I’m seriously concerned that poor man is going to have a whole stack of journals to read by the time he gets them…) or when something is going on, when I feel more called to write to him. I write as if I’m just talking to a friend about what’s been going on lately, what I’ve been worried about, or how I hope he’s doing. It doesn’t have to be anything award-winning, it just has to be from the heart! I meant for this post to be short and sweet, but that definitely didn’t happen, ha! This is one of my favorite, most personal topics to write about, so I truly hope you enjoyed it. If you’d like to see more posts about singleness and praying for your future husband, be sure to subscribe below and leave me a comment! This is so friggin cute! I have found in the past couple months how real and amazing prayer is. It is effective, and God will give us the desires of our hearts – which is a beautiful thing! Thanks for encouraging the #prayerlife and reminding me that it is okay to hope for something amazing. I’ve been realizing that this year too, love your blog, girl! Blessings! You already know I’m obsessed with this topic. You’re writing is beautiful and so grounded. I had a good reflection on this post. Yes girl!!! So glad to hear it! Love this! I started praying for my future husband about two years ago and it’s definitet one of the best decisions I’ve made!